Square Enix is bringing Dontnod's "Life is Strange," an episodic game about time manipulation, to iOS from Thursday. Ported by Black Wing Foundation, the critically-acclaimed title follows the story of Max Caulfield, a student who has the capability of rewinding time and changing events, in order to force a more favorable outcome. Discovering the power by saving her best friend Chloe, Max pairs up with her to investigate the disappearance of another student, and in turn uncovering a dark side to Arcadia Bay, the game's setting. The player's choices for each scene also affect the overall story arc, with decisions from earlier in the game affecting later elements, with multiple endings to the story depending on their selections. 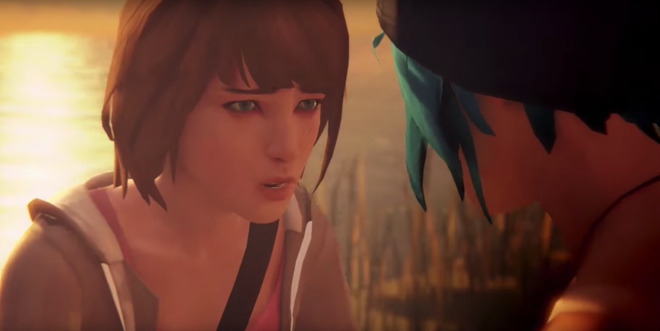 "Life is Strange" received praise at the time of its original release for how it handles mature themes in its story, such as suicide. The 2015 release's warm reception helped spawn a prequel called "Before the Storm," a three-episode standalone story set three years before the events of the original game. For the iOS release, "Life is Strange" has been given an enhanced user interface made for touchscreens, iMessage stickers, and the ability to share game progress on social media. Playing on Max's in-game photography, a new Photo Mode is included for players to take pictures and apply filters, before sharing the results. Available to pre-order before its release on Thursday, "Life is Strange" costs $2.99 for the first episode, with the second and third available as in-app purchases. Episodes 4 and 5 will be released in early 2018. Limited to users aged at least 17 years old, "Life is Strange" requires iOS 10.0 or later, and is compatible with the iPhone 6, iPad 5, iPad Air 2, iPad Mini 3, iPad Pro, and newer models. Originally announced in April, "Fez Pocket Edition" is a port of the 2012 platform adventure game by indie developer Polytron. Playing as Gomez, a creature that exists in a two-dimensional world, a gift of the titular hat grants the main character the ability to interact with the world in the third dimension, turning the camera's viewpoint by 90 degrees and changing the layout of the level. Using the world-twisting ability, Gomez has to explore the environments to find doors to other areas, turning the cube world to see things not visible in other viewpoints, such as bits of the destroyed hexahedron the player is tasked with colllecting, and to create pathways. For example, sections of an unusable ladder may appear in different areas of a wall in one view, but turning 90 degrees makes the ladder temporarily whole again, allowing it to be climbed. "Fez" is also full of cryptic puzzles that are not part of the main story, including codes that hint to extra collectable items and secret rooms. After finishing the main game, players can then re-enter the world to find more elements of the hexahedron. Weighing in at 174 megabytes, "Fez Pocket Edition" is priced at $4.99 and is available to download now from the App Store. The game requires iOS 8.0 or later, and is compatible with the iPhone 5s, 6th generation iPod touch, iPad Air, iPad Pro, and later models. FEZ 2017 from POLYTRON on Vimeo.